Hey readers…aren’t you glad you can? Read, that is. I’m delighted to co-emcee the 10th Annual Butte County Trivia Bee on Friday, October 28, 2016. The event will be held in the Sierra Nevada Brewery’s Big Room–fantastic venue–beginning at 6 PM. 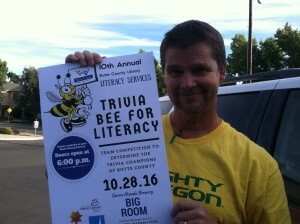 For ticket or competition information call the Butte County Library at (530) 538-7198. All proceeds benefit Butte County Library Literacy Services. Last year I had a blast and so did 400 others, come on out.